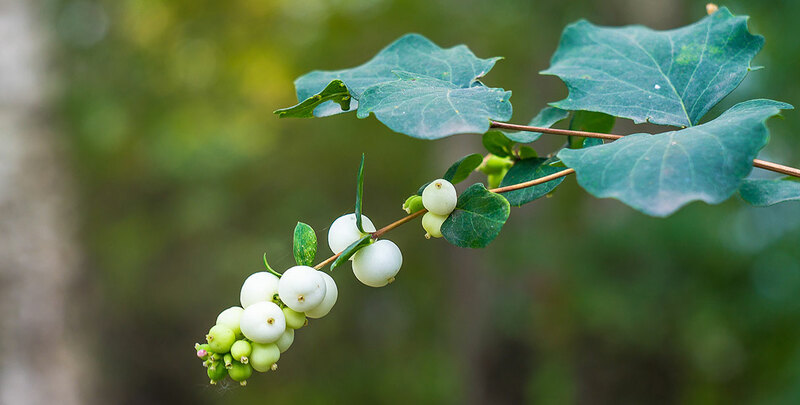 Snowberry, also known by its botanical name symphoricarpos, are a genus of about 15 species of deciduous shrubs, which particularly stand out due to their conspicuous, large berries that are borne in dense clusters. This is also what the botanical name of the genus refers to, as “symphoricarpos” is Greek for “fruits that grow together”. Not every species from this genus is suitable for hedging purposes, but the snowberry ‘Magic Berry’ or symphoricarpos x doorenbosii ‘Magic Berry’ is a cultivar that lends itself perfectly for hedging. Snowberry ‘Magic Berry’ hedges have a compact, dense growth habit and make good informal hedges that will also add late interest to mixed hedgerows. However, they also make excellent, attractive single species hedges. Snowberry ‘Magic Berry’ is adorned with ovate, dark green leaves that turn yellow in the autumn before being shed in the winter. White-pink, insignificant flowers appear in the summer and while the ornamental value of these flowers is limited, they are highly attractive to all kinds of pollinating insects, like butterflies, bees and bumblebees, because they are rich in nectar. However, snowberry hedges really come into their own when these nutritious flowers are followed by large quantities of striking berries that ripen to a bright rose-pink colour in the autumn. Please keep in mind that these fruits are exclusively valued for ornamental purposes, as they are inedible to humans and birds alike. They are not extremely toxic, but will certainly cause gastrointestinal distress when consumed. Most snowberry species are native to North and Central America, with the sole exception being the symphoricarpos sinensis or Chinese coralberry, which originates from western China. By the time snowberry species were introduced to gardens in the UK in the early nineteenth century, they already had quite a history in North America. Native Americans used the plant as a natural soap and shampoo, while its thin, but hard wood was often used to fashion arrow shafts. In fact, crushed snowberries are still used as a kind of natural hand lotion in Russia these days. Many birds and small animals use snowberry hedges as a nesting place, which is why the species is a very popular hedging plant for wildlife hedges. But of course, the berries are the main feature of the snowberry. They are remarkable for more reasons than just their colourful appearance. 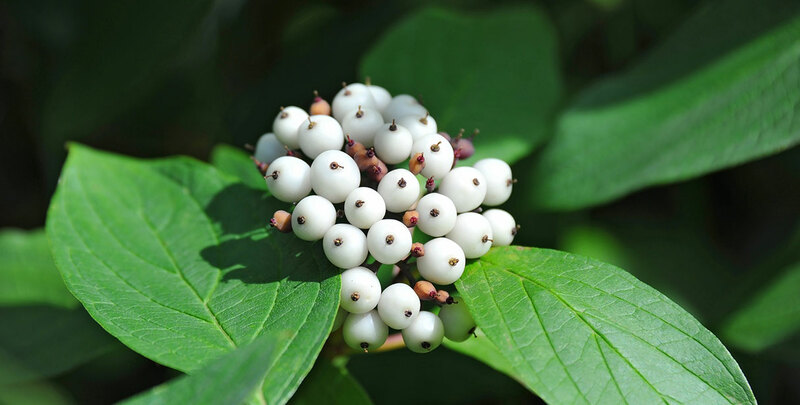 First of all, the snowberry has a relatively long flowering season, flowering from May to September, while the fruits ripen from September to November. In addition, the fruits stay on the plant well into the winter, making any snowberry hedge stand out long after its elegant foliage been shed. Even inexperienced gardeners will be familiar with the cracking sound that the berries make when they are stepped on, especially on firm ground. 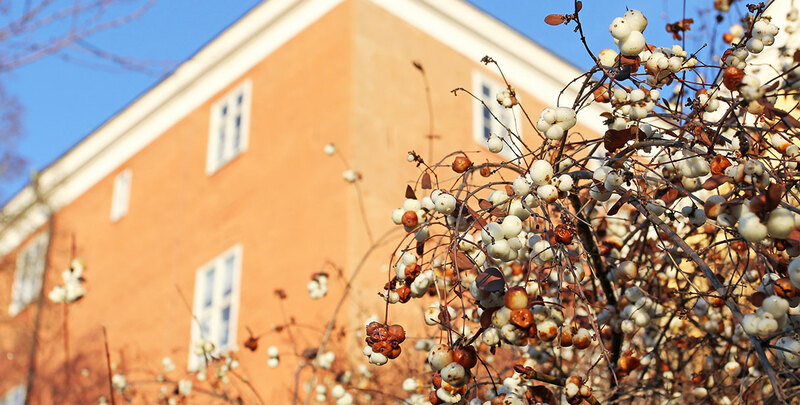 Landscapers prefer the snowberry due to its versatility when it comes to planting positions and temperatures, which is why snowberry species – the symphoricarpos albus or common snowberry in particular – are often seen in public parks. 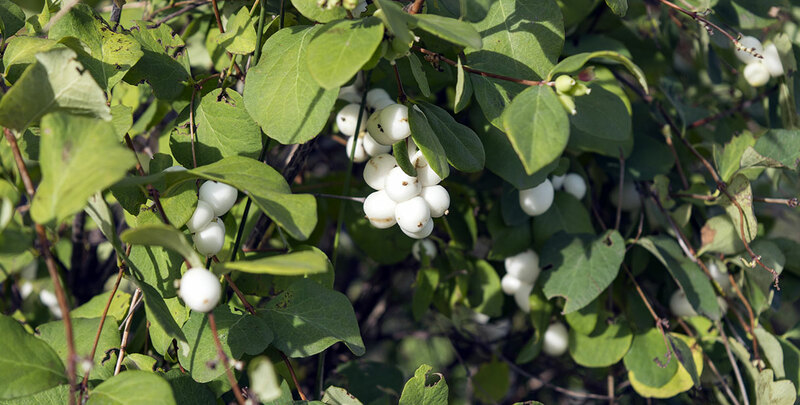 In the wild, snowberries are often found in swampy thickets or among stream banks. And while snowberry hedges tolerate a wide range of soils and are able to thrive in a dry soil, they are ideally planted in a fertile, well-drained moist or normal soil in the full sun or partial shade. Snowberry makes fully hardy, tough hedges that tolerate exposure, poor soils and even pollution, although these circumstances are not perfect for the snowberry ‘Magic Berry’ cultivar. After they have been planted, snowberry hedges will grow at a rate of 15 to 30 centimetres per year, which can be considered average to fast growing. Under the right conditions, your snowberry hedge will reach up to 1 metre in height. Maintenance can be restricted to removing any misplaced and unwanted branches and cutting back shoots to a few healthy buds directly after the flowering season. You can choose to trim your snowberry hedge to shape in the early spring. It is important, however, to keep the soil moist until your snowberry hedge is well-established. Once this is the case, it will tolerate prolonged dry periods, but it will certainly appreciate having its soil fertilised every year. Since snowberries are prone to suffer from diseases like rust or powdery mildew, make sure that you allow plenty of air to circulate around your snowberry hedge. Pruning back diseased and damaged branches will certainly improve the circulation. Luckily, it is fairly easy to prune a snowberry hedge with long-handled pruning shears. If you are looking for a hedging plant that will have a striking look for the longest possible period, a snowberry hedge may just be exactly what you are looking for. Its flowers are rather inconspicuous, but pollinating insects will certainly look forward to them and will make your garden a little livelier in the summer. But naturally, the large, colourful clusters of berries are the main attraction of the snowberry and they will decorate your garden well into the winter, so that your snowberry hedge will stay beautiful long after its leaves have fallen. Since snowberry hedges do not grow very tall, they make lovely low border hedges. They also make an excellent component of mixed hedges though, which will allow you to create a mixed hedge in which colourful flowers will be followed by the conspicuous berries of the snowberry ‘Magic Berry’ and prolong the period during which you can enjoy a lively, colourful garden.